Are you looking for a natural solution to headaches, insomnia, digestive disorders, stress and anxiety, or muscle and joint pain? You will receive the benefit of our 25-plus years of experience, making sure that you get the effective care that your body requires to get better. With several different healing solutions available, we can effectively treat a wide variety of ailments. Read our patient reviews to see what people have to say about North Bay Chiropractic and Acupuncture Center! The recommendations we will make to you are based on an extremely thorough evaluation process. Your health goals and objectives are considered each step of the way, ensuring that our plan will work for you. Are you wondering whether chiropractic, acupuncture or herbal medicine may be helpful for you? We’d love to answer any questions you may have. Take the first step towards relieving pain and discovering wellness by contacting our office today. 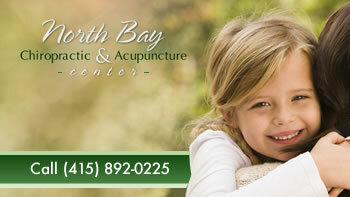 Helping families in Novato and North Bay with all of their chiropractic, acupuncture and herbal medicine needs since 1990.